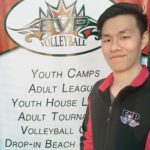 Chien has been a valuable member of the EVP Coaching staff for a number of years now, but this year he will be taking on the challenge of Head Coaching the 16u boys team. Chien has spent the last 2 years competing with the Sheridan Bruins, who recently made team history and won their first OCAA Medal in over 24 years. Chien is well known among the adult community, and as a coach for all of our programs familiar with many of the kids in the club. Chien is known to be a versatile player, capable of playing all positions at a competitive level. His wealth of experience competing at a competitive level of volleyball is something he is looking to bring to the club this year. Chien was an untraditional athlete, having only played 1 year on his school team, no club experience but made the jump to the Varsity Men’s team. Chien expects to share his experience of hard work with any athlete looking to make it to the next level, and share his love of the game with younger athletes hoping to create that same passion.